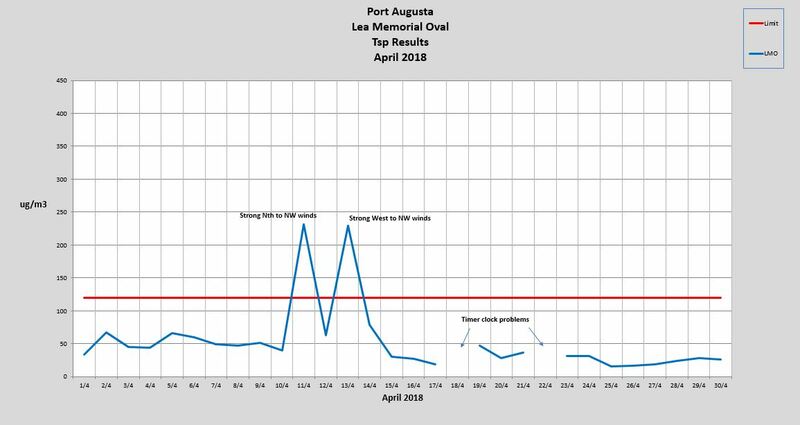 Flinders Power together with the EPA is monitoring air quality in Port Augusta through a network of monitoring units installed in the community. We have commenced a series of regular updates in order to help keep you informed of activities taking place. * Please Note: This data has not been verified, the data is checked to verify that it is accurate and data that is incorrect is either corrected or removed. A long term solution for the rehabilitation of the ash storage area has commenced and involves the application of topsoil, seeded with native plants and grasses, which will cover the entire ash storage area. The application of topsoil over the ash is considered the most effective process for the long term management of the area. This work will continue over the next six months with appropriate mitigation measures to be used to manage dust that may be generated during the topsoil application. 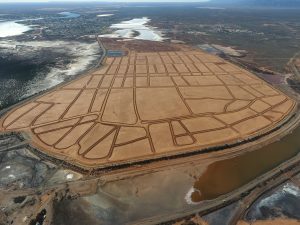 Flinders Power has undertaken a comprehensive study of methods to improve short-term dust control at the rehabilitation area, while not adversely impacting the long-term revegetation objective. Should you have any questions or comments, please don’t hesitate to contact us on the numbers provided. 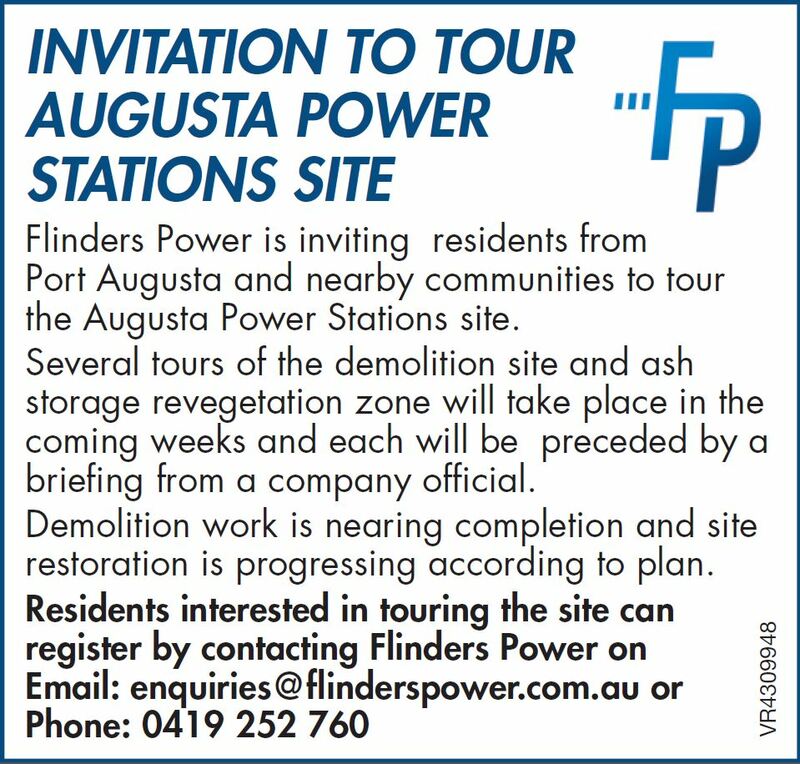 One of the recommendations from the Community Open Day included the establishment of a community reference group to ensure a conduit between community leaders and Flinders Power. We have contracted a South Australian, independent facilitator to form, chair, manage and support our community reference group. The group will help to guide and shape our community engagement and communications activities. 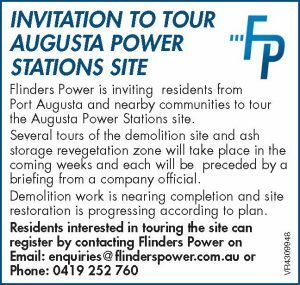 Representing the issues, concerns and values of the broader Port Augusta community, the group will act as a conduit to facilitate open, accurate and reciprocal communication between the community and Flinders Power. Housing SA, Port Augusta Regional Health, State Member for Stuart, Port Augusta City Council, Department of Education and Child Development, Port Augusta Coastal Homes Association, Centacare and community representatives. The first meeting was held in April 2017 and the minutes and Terms of Reference will be made available. We will continue to work with the Group to help guide our future communications. Please register your details below if you would like to receive our community information updates.